With Spring 2003 upon us, I find myself haunted by memories of two important women in my life, and how their lives intertwined with mine, yet the two of them never even knew each other except through conversations with me . Sadly, both of these beautiful women who had so much to offer this world, are gone. The following e-mail letter and story which I sent to Jody Stewart of Cerro Gordo in the fall of 1998, is a tribute to both Jody, and to my dearest friend, Pamela Macaluso. The spirits of both of these women will live on in my heart and in the hearts of all who knew and loved them. We buried Pam on April 5th, 1997. Jody Stewarts Memorial Service was in May 2002. I like to think they are friends in heaven now, and I know they are my guardian angels. The same year I lost Pam, I also lost my father, and this serves as a tribute to him as well. Jody, I sent you a thank you note in the mail for once again hosting our Fat Hill Fandango 4 wheel drive tour, but I also wanted to send you the story I wrote about our trip. I thought you should read this and understand why my visit to Cerro Gordo was bursting with emotions this year. This was a very emotional trip for me this year. 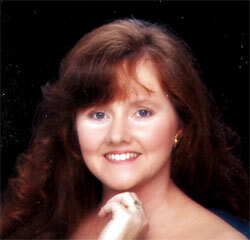 In March of 1997, my dear friend Pamela Macaluso, who had some fame as a romance novelist for Silhouette Desire, was a victim of a murder suicide by her husband. She had finally had the guts to tell him that she wanted a divorce, took two weeks to be by herself and really decide what to do, then when she did tell him she was sure about divorce, he killed her, their two teen-age sons, and himself. In the past six months before this, Pam and I had renewed our friendship through e-mail. In the middle of the night if I couldn't sleep I would go to the computer and send her a message and sure enough there was always one immediately back from her. She was up in the middle of the night working to finish her latest romance novel, so I knew she was there when I needed her. It was interesting that considering over 20 years of friendship, first as giggling young women who shared a lot of good times together, then as pen pals as she traveled all over the country with her husband who was in the air force, then again as e-mail pals, Pam never said a lot to me in those late night e-mails. I would pour my heart out to her with my day to day life as a YMCA receptionist and my more exciting life as 4-wheel drive tour guide. She thoroughly enjoyed my stories, and couldn't wait to get them from me, but she never talked much about anything other than her writing deadlines, the weather, and making sure I was ok. One day after a fight with Roger, I decided that this was the perfect opportunity to get Pam to open up about her married life. I complained about communication problems and how difficult it can to be to live with a man sometimes and I suggested to her that perhaps she and I run away together and start a new life. I had hoped she would open up with her problems with an overbearing dominant husband, but she didn't. She just agreed that sometimes living in an all male household (her husband and two boys) was difficult and she really would like to run away with me. So knowing that something just wasn't right, because she wasn't telling me anything - I told her about Cerro Gordo and the Belshaw House and how it would be the perfect place for her and I to escape to. I was half serious and half kidding, but if Pam had packed her bags like she wrote me back and told me she was going to, I would have gone up there with her, and perhaps she would still be alive today. I found out about Pam's death on the radio, the very day I had expected to hear that she had come back from her trip. My son, who was like a nephew to her when he was little, heard the names on the evening news - I had only heard that 4 were found dead on Vandenberg Air Force Base. He came over to break the news to me. Roger, Eric and I grieved together. We spent the next days desperately trying to get a hold of her mother and sister so we could share in their mourning and attend services. Later her sister put the pieces together and we realized that Pam's marriage had been one of abuse the entire time. I just knew that her husband was domineering and would not let her have a life of her own. Pam had found herself through her romance novels and I pictured a short overweight redhead with no life except her husband and boys and the books she wrote. My e-mails to her must have provided great enjoyment and pleasure to her - especially the ones about our 4-wheel drive trips. I now realize if I had driven up to Vandenburg and told her I was taking her to this privately owned ghost town, she probably would have gone with me and we would be writing novels together. After each of my 4-wheel drive tours, I send my friends little stories about my adventures, and sometimes Roger has them published in the newsletter. The one I wrote about this year's Fat Hill Fandango was a little different than what I usually write - but it was a story that needed to be told. I really wanted to share all of this with you when we were up there, Jody, but what with the tour for us- and all of those Sierra Clubbers just leaving - the timing wasn't right. My apologies for any typos and any facts I didn't get quite right - I dont have the memory for such things that Roger has. Oh----also, you might appreciate knowing that Pam's sister made sure that her last novel got finished and published and when it came out throughout the entire country began a grassroots effort to make sure that her last novel was sold and her life was not in vain. All proceeds from the novel went to battered women. You can find her books and info about her at amazon.com, by the way. We got home yesterday around 5:30 PM. Had an absolutely wonderful trip. Our Kernville Kaper tour was great, as was our Fat Hill Fandango this weekend. Of course the 4 days in the condo in Mammoth were fantastic. We relaxed, and read, and watched a little tv each evening. Around 10 or 11 every day we did a little exploring, then got back to the condo by 2 or 3 most days. it was beautiful weather; blue skies, lots and lots of fall color, but crisp and cold - leggings and sweaters and long underwear were in order for dress most days. Thursday morning was the coldest - the indoor outdoor thermometer in the condo read 25 degrees. 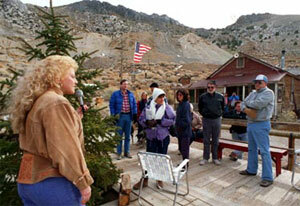 In Lone Pine it was warmer but we still needed to wear jeans and long sleeves. yesterday it got warm enough to change into shorts - but that wasn't until we hit Panamint Valley, just west of Death Valley. It was a sentimental weekend for me. Saturday we took our tour through Manzanar, the WWII Japanese relocation center. I always feel the souls of those Japanese buried there. The last two times I was there I have just bawled because two years before my Dad died we took him and Mom for a weekend in Lone Pine. I can still see him standing at the cemetery looking at the tall monument that stands there. I know what his feelings for the Japanese were during the war, and I can imagine seeing Manzanar brought new meaning to this time period for him. So when I get to the gatehouses, I just start bawling with memories of my Dad and feelings for what these Japanese must have gone through. But the memories of my Dad are good ones, and I always feel cleansed after we leave and I am able to control my feelings. One of the ladies on the tour walked through the cemetery and the ruins of the Old Japanese gardens and ponds with me and we talk fondly of my Dad. So that was nice. She told me that my Dad was with me, and I told her he had been with me all week, because I dreamed of him every night we were in Mammoth, and I am sure he sat in the back seat of the car while we were touring. Of course the trip to see Jody Stewart and Mike Patterson at the Cerro Gordo Mines high in the 8,500 foot level of the Inyo mountains, was equally sentimental for me. Jody had told us that she had 100 Sierra Clubbers camping out that weekend and they would be leaving as we came up, so we went around the north side of Owens Dry Lake and up the back way, just at the tip of Death Valley National Park. Before we hit the dirt, still on the highway north of the lake, I began reminiscing about Pam and how she and I fantasized moving up to Cerro Gordo into the restored Belshaw House and just spending our days writing and not worrying about anything else. I remember after I described Cerro Gordo to her and told her I would whisk her away and we could retreat there - only allowing Roger and the tours to come visit us once in awhile - she sent me e-mail and said she was packed and ready to go. You don't know how many times I wish she had really done so. I remember telling her - ok - but you'll have to drive the highways- then I'll take over on the long steep uphill dirt Yellow Grade Road that leads up to Cerro Gordo. I had a serious cry in the car before we had to deal with the tour again. I cannot tell you how fantastic it felt to hit the top of the mountain and up and over and down a bit to Jody's privately owned ghost town. Most of the Sierra Clubbers had already left, but we still had to crowd in a bit to find parking near the restored hotel. Before I could get my door open, Jody Stewart, our ghostess, as Roger always fondly calls her, comes tearing out the hotel door and down the steps calling "Cecile...Cecile..is that you?" and I'm running out of the car and up towards her as fast as I can. We lock ourselves in a big hug, oblivious to the rest of the people just getting out of their cars. I was overwhelmed with such emotion I cannot tell you. Jody is a gorgeous blonde and the most loving and laid back person I know. I always feel such a sister-hood with her, and I think she must have one with me as well. Many times we have sat in the freezing cold on the deck in front of the old general store that is now a museum and we have talked and talked while Roger and Mike took care of our tour. I was bursting with such emotion, I wanted to whisk Jody away and tell her my story about Pam, but it just didn't seem appropriate since this time we were on a tour, not just a private visit. We waited for the rest of the group to catch up with. Jody greeted Roger with an equally big hug, and welcomed us all into the hotel. The first years we came to Cerro Gordo, Jody had the big house that she lives in completely restored, and in later years the bunkhouse was restored for volunteers and guests to stay in. And the smaller Belshaw House was restored, as well. But the old hotel was full of real ghosts and quite disrepair. I hugged Jody again as we went in the lobby and got my first view of the downstairs with its Victorian lace covered tables, and cast iron heating stove. Orange and black crepe paper and pumpkins decorated the room. Wonderful smells were coming from the kitchen and we were lead through the double swinging doors to find the volunteers cleaning up after the lunch they had served to the Sierra Club. I looked at Jody and told her it was true - dreams could be fulfilled. And she agreed with me. We were all asked to sit and relax wherever we chose around the huge dining room of the hotel, and Roger filled us in on the history of the Cerro Gordo Mines, while Jody made coffee and served us. When he was done, Jody told us how she inherited the town in 1985 and I realized that basically Jody and the Cerro Gordo had grown up with our 4-wheeling tours, because we had come up for our first visit probably in 1989. Our tour found Jody absolutely charming and wondered at how she had come so far in so short a time. Jody worked in Hollywood - I believe she was an assistant to a producer or something - and got a call from an Aunt and Uncle who were caretakers of Cerro Gordo and had run out of money and needed help to keep the town. Her uncle took her all around the mountain and told her the town history. She just sat down and cried the first few days overwhelmed by everything, then envisioned this dream with the main house restored full of her antiques from LA and boarding rooms for guests. Mike Patterson helped her with the dream. In the midst of Jody's story, Mike came down from the mine tour he had been giving a few remaining Sierra Clubbers, and she turned the talk over to him. Roger and I met her in the kitchen while she prepared more coffee for refills, and we visited a little bit before going on with the rest of the tour. We went across the dirt main street to the museum for a look. Meanwhile Jody politely hurried the visitors out of the Belshaw house so she could prepare it for the next visitors, and give our group a look see. Three years ago the Belshaw House was being lived in and looked great, but Jody had been quite busy there as well. In the bedroom and the kitchen, I realized the canopy, the curtains and ironing board cover were all made of the same materials. I turned to the women in our group and said that I imagined Jody had hand sewn them herself. I found Jody changing the bedding on the bed, and asked her if she had, and she said yes. I reminded everyone that the first time I approached Cerro Gordo, Mike greeted us as we drove up, but Jody was too busy moving telephone poles. This lady who lifts telephone poles, and can be seen in a documentary about the Mojave desert as she goes down in the mine with a crew on a search for water, not gold or silver, also greeted previous tours with coffee and homemade pumpkin cookies, cooks full Thanksgiving dinners for anyone who happens by that day, and she hand sews her own canopy and curtains. Meantime, she manages to look gorgeous with her blonde curls, her blue jeans and her cowboy boots, all the while, and she greets nearly everyone she meets with that warm smile and hug, none the worse for wear. Mike and Jody at last were able to relax a bit after their busy weekend, because Roger could do this town tour for them. We went up into the mine area at the very top of the hill, and felt the ghosts I the rickety falling down mine buildings. Then we headed back down to the hotel. Part of our tour were already on the deck with Jody and Mike just relaxing and "chewing the fat". We join them and talk about their efforts to restore this old place, and how far they have come yet how far they have to go. Jody wants to get a grant to bring inner city kids up to help with her restoration efforts and to teach them how to hammer and nail and saw, instead of rebel with drugs and violence. She envisions her newly formed historical society with a real museum up at the mine instead of the rustic one in the old general store now. One time, she and I sat on that porch and envisioned horse and carriages going up and down main street with her guests, and perhaps Roger and I telling Cerro Gordo stories to people as they came up on old wagons. We may yet see these dreams come true. nearly ten years ago - she and Mike imagined the bunkhouse and the old Belshaw House filled with guests, and the hotel dining room ready for their meals. Roger and I imagined bringing tours in to visit. After four hours at Cerro Gordo, climbing its hills, examining its old buildings, learning of its history and enjoying the company of owners Jody and Mike, we have to say good bye. I picture Pam and I in the old Belshaw House with its bookcase lined living room wall and green leather couch, and chairs, sitting and laughing and writing stories together as we sip hot tea or gourmet coffee. Perhaps Jody would be there sitting with us, writing as well. She always said she thought she would finally be able to do some writing herself when she came to this old ghost town and instead the only writing she had done was write checks for all of the restoration. Back to reality as Roger and I hug Jody one last time and promise to come back next year for a private visit, as well as bring in our tour in the fall. I remind Roger that if he's not good to me, I'm moving into the Belshaw House by myself and helping Jody and Mike build that museum. Jody smiles and tells me its mine whenever I want it. Jody hugs everyone else in our group while Mike shakes hands with Roger and I and thanks us for bringing everyone up. We head to our vehicles and down the Yellow Grade Road with a great view of Owens dry lake and the Sierra Nevada mountains in the distance. Just before we wind down into the tiny town of Keeler at the main road, we finally look in to one last narrow canyon and see the remains of the tramway that was used to transport ore by the Cerro Gordo miners. There between two mountain tops, hanging on a cable, an old tram car swings with the cool breeze. Someone in our group laughingly points to the car and says, "Can't you see the person in there waving to us?" Everyone laughs with them, but Roger and I turn to each other with visions of Pam with her red hair flying in the air as she sits in that old rickety car. Perhaps she did get to move to Cerro Gordo after all. I secretly wished that at least a falcon would fly overhead, as it did when we buried her. I smiled up at the tram car, then turn back towards the road that leads back up to Jody's: "Goodbye Cerro Gordo ......we'll see you next year." 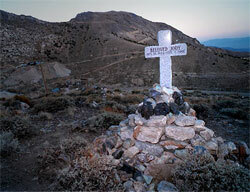 Sadly, the next time we visited Cerro Gordo, Jody Stewart had discovered that she was ill. In a strange way, Jody probably never realized it, but she help ed me to live out part of my dream to experience Cerro Gordo. John & Roxie Bowden were hired to manage Cerro Gordo when Jody became ill. Roxie was a nurse and also helped to take care of Jody as she was dying. Coincidentally, Roxie was the stepsister of a close friend from high school, and through Roxie, I was able to experience my dream of staying up at Cerro Gordo and volunteering. Unfortunately, though I was honored to do so, the volunteering I did was to help with Jody's memorial service.